The Woolsey Fire races down the mountain at the end of our road on its way across Pacific Coast Highway and through Point Dume to the beach at Westward. I've been covering news stories about the Woolsey Fire for what feels like several lifetimes but is really less than a month, but I wanted to share some of my personal experience during this strange and tragic time, not as a journalist but as a resident and an eyewitness to a disaster that has changed the face of Malibu forever. Part of this account appeared in the November 16 Messenger Mountain News under the title "Get Ready, Malibu!"). Part has been pieced together after my return home, as I learned more about the struggles faced by our neighbors who stayed behind and fought the fire to save all of our homes. 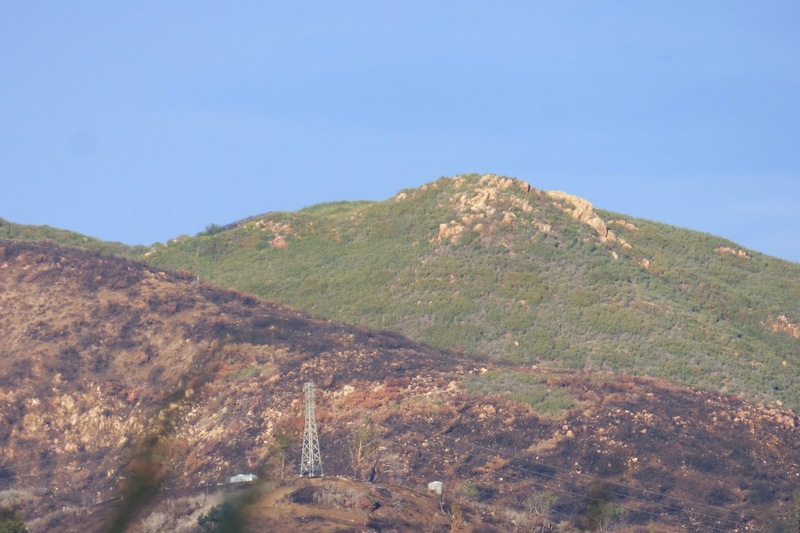 The fire broke out on November 8 in Woolsey Canyon, at the old Santa Susana Field Laboratory on the edge of Simi Valley. I couldn’t sleep that night. I sat in front of the computer, watching as the Woolsey Fire spread towards the Santa Monica Mountains. It did, but it was much worse this time. The fire arrived in Malibu after wreaking havoc in Simi Valley, Oak Park, West Hills, Thousand Oaks, and Agoura Hills. The fireline was 14 miles long when it jumped the 101 at multiple points near Liberty Canyon. It burned through multiple canyons simultaneously, driven at first by 60 mph Santa Ana winds, and then by the wind generated by the heat of fire itself. A friend called just after 7 a.m. to tell us there was a mandatory evacuation, but there was no way to leave: Pacific Coast Highway was jammed from Zuma Beach to Santa monica. Our official call from the city didn't come through until around 10 a.m. My octogenarian mother and I waited at home, car packed, dog at our feet, and cats stored in carriers, with the fire coming closer and closer. We left just after 2 p.m., when word reached us that more lanes on PCH were now open for southbound evacuees. They weren't, but at least northbound traffic was shut down, and there were fewer cars on the road. 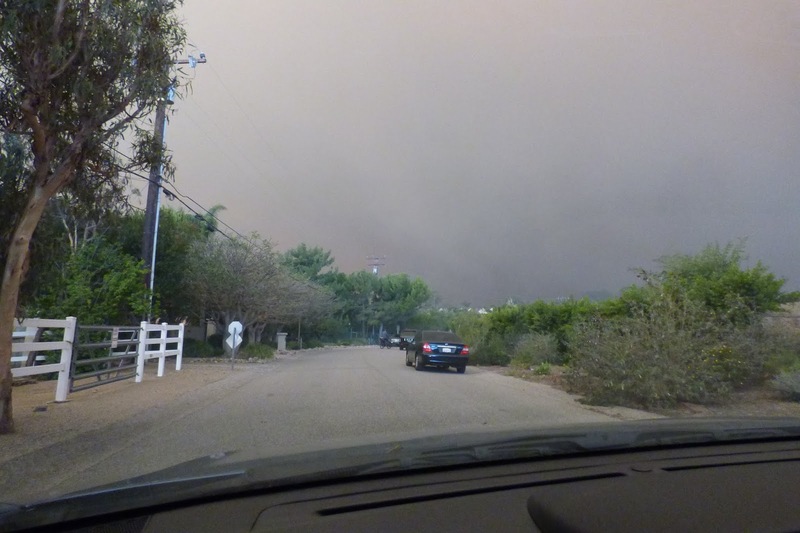 When we left, the fire was no longer advancing down Kanan Dume, it was raging through our neighborhood. 9:10 a.m., on November 9, looking northeast towards Corral Canyon from our back garden on Point Dume. 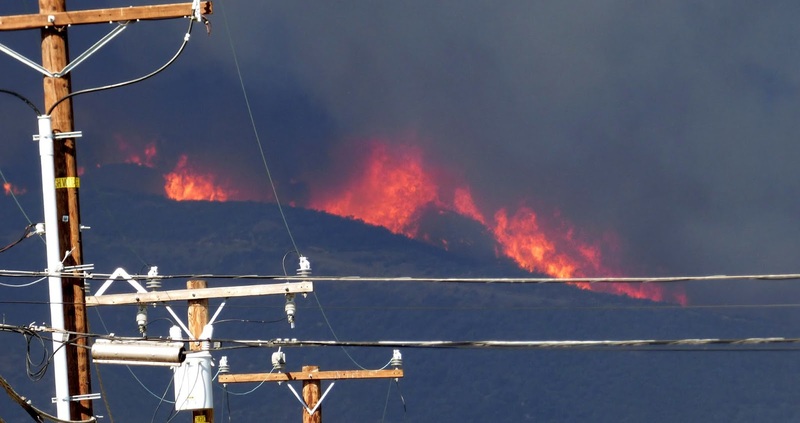 A few minutes later, the firestorm crested the mountain at Corral. 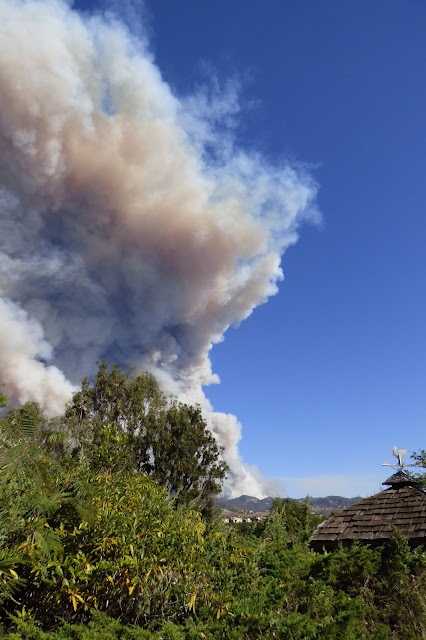 It was burning through Latigo and Escondido canyons within minutes, not hours. Those little white specs are fixed-wing aircraft, preparing to dump water or the fire retardant Phos-Chek. 10:03 a.m., looking up the street towards the mountain between Kanan and Zuma. The fire to the left of the fire break is headed towards Malibu Park. 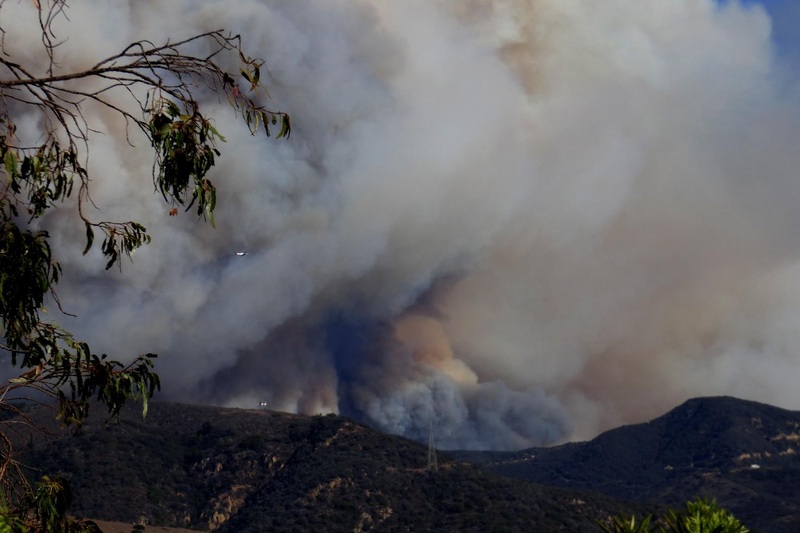 It seemed then that the fire would bypass Point Dume as it has in other wildfires. It didn't. 11:11 a.m. 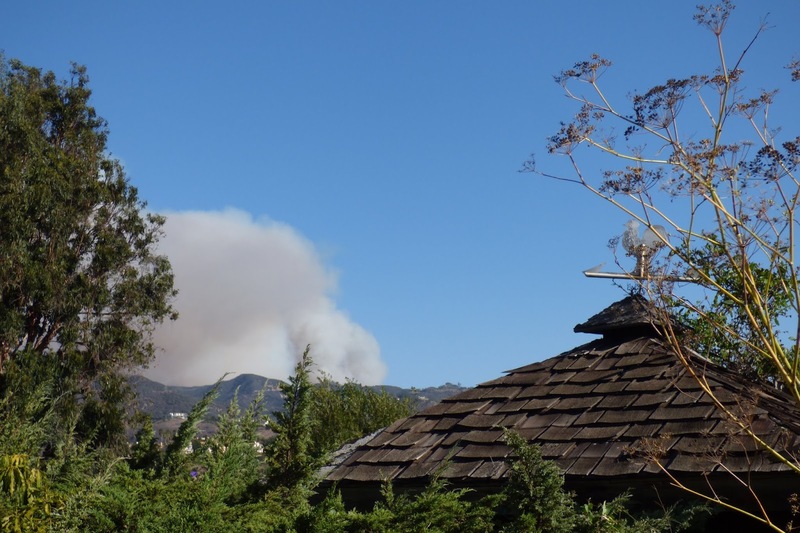 The fire line has spread further east and south, and is now heading straight for Point Dume. 11:24 a.m., looking north, towards the smoke cloud over Dume and Ramirez canyons from the backyard. Evacuating at 2:20 p.m. The fire is still advancing, but the smoke was so thick we could no longer see it. The wind died, the smoke made it seem like twilight, and we could hear the hum of the fire through the gloom like the sound of bees, punctuated with the dull thump of things blowing up in the distance. A screen capture from the live ABC 7 news broadcast, showing what the same area looked like after we left. A massive whirlwind of fire swept to the coast. 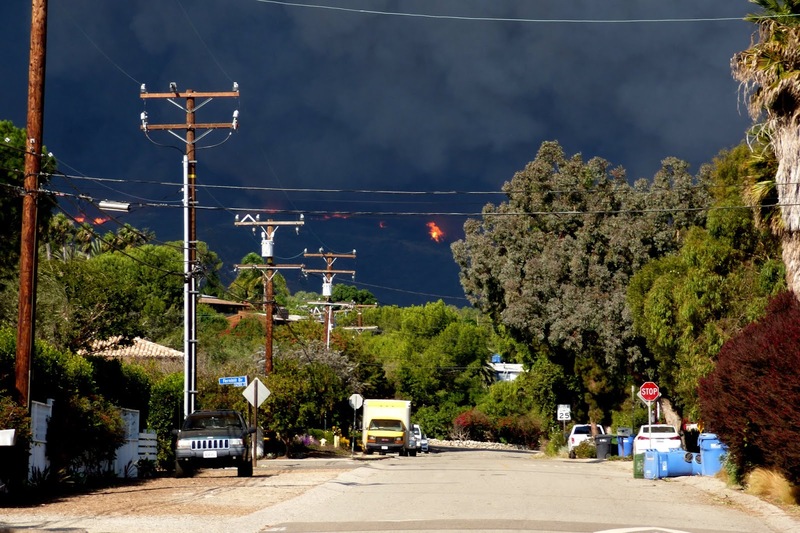 Malibu Park experienced a true "firenado," a tornado of flame descending from the sky. It tore up trees and power poles as it ripped through the residential neighborhood. Malibu Park resident Kevin Hughes took some terrifying video of the phenomenon as it began to descend on Malibu Park, west of Point Dume. Point Dume wasn't hit by a whirlwind, but it was engulfed in a wall of flame that swept across Pacific Coast Highway and through the canyons like a river. My family has weathered many Malibu fires. I've never seen anything like this. One of my earliest memories is the 1970 Wright fire, my father holding me on his shoulders in front of the house, pointing to the glow on the horizon. He was the kind of person who refused to evacuate. I remember him on the roof, with the garden hose, watching fires approach in 1978 and 1982. Every time, he helped the neighbors, and my parents opened the house to evacuees from other parts of the community. In 1993, during the Old Topanga Fire, he had to evacuate the family’s gallery in the Malibu Country Mart, but wouldn’t leave our house. In 2007, during the Corral Fire, when his ill health wouldn’t let him fight back he still didn’t want to leave, and we weathered that storm. He always felt confident that Point Dume, where we lived since the 1960s, wouldn’t burn—it never had, he said. At least, not since the neighborhood was built in the 1940s. He passed away in 2017. I’m glad he didn’t see what happened on November 9, when the Woolsey Fire swept through the Point. It took four hours to reach my brother’s home in Seal Beach, and then an agonizing 12 more hours of not knowing what was happening. Finally we heard from a friend who stayed behind that our house and those of our immediate neighbors were safe. When we finally returned home 10 days later, we heard about the neighbors who stayed behind and fought the fire, not once but multiple times. Embers carried by the wind kept spreading the fire to houses not burned in the first wave. Gas lines at burned out homes fountained flame. There was little water, no power, and no communication. Crews of residents and the Point Dume Bombers—volunteer firefighters with dirt bikes, a water truck, and grim determination, fought to save houses. There was no official news, only scatted reports on Twitter or Nextdoor, and videos shot by more intrepid neighbors who hired boats to take them back in, or who made it through on back roads. We watch news helicopter flyover videos over and over again, searching for friends’ homes or the places where their homes once stood. The wait and the lack of information was like a physical pain, only alleviated by confirmation that another person had come through safely. Then it was back to waiting. When we finally returned home, the devastation was unbelievable. 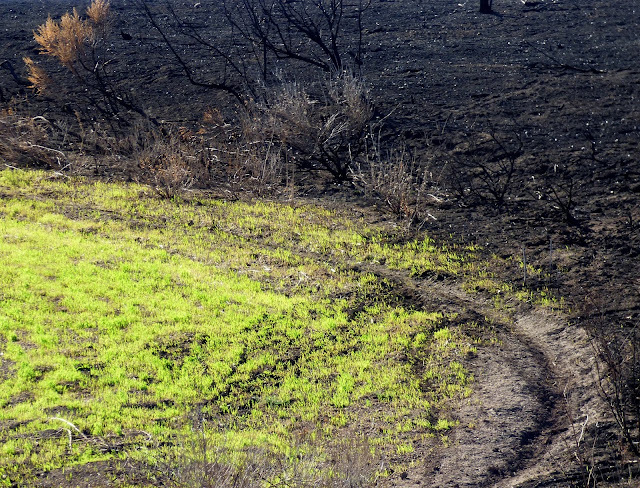 Charred hills in every direction, houses erased as if they had never existed. Fully one half of the Santa Monica Mountains National Recreation Area was burned. 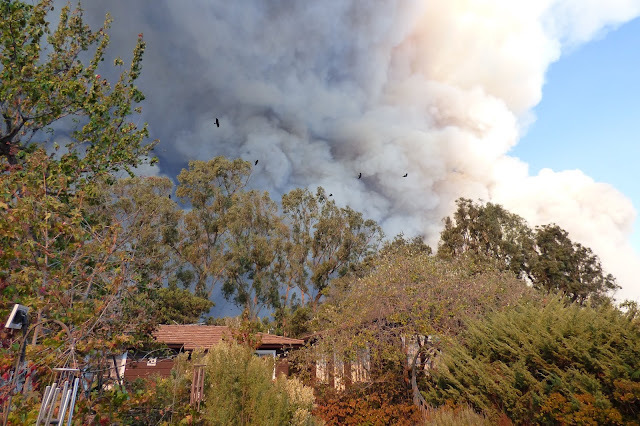 An estimated 1600 structures were lost, most of them houses, at least 450 of them in Malibu and maybe as many as 680. We were blessed to have a home to return to. Just five houses were lost on our street, and two on the street across from us. The main reason more houses in our immediate neighborhood didn't burn was that small group of residents who stayed behind to fight the fire. 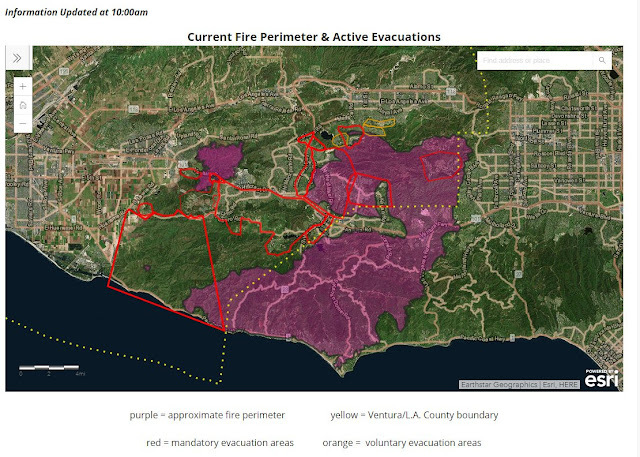 I took a screen cap of the fire map on November 10. 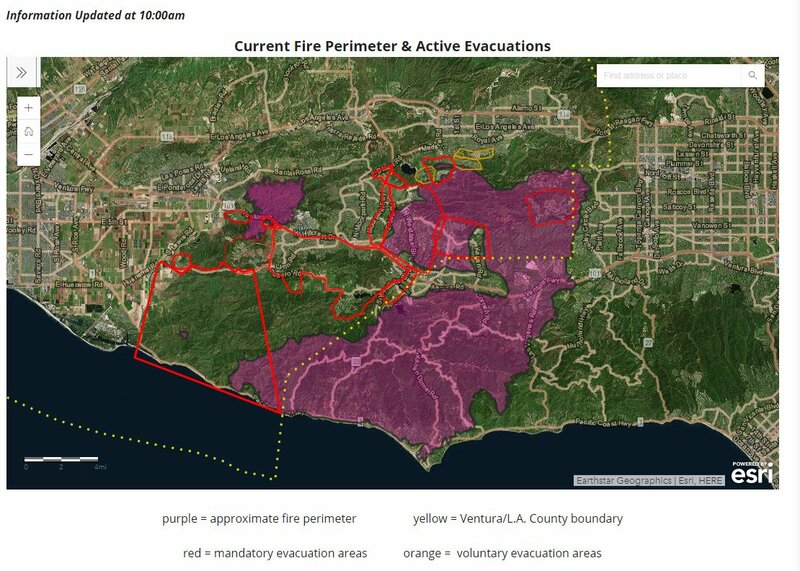 The purple area shows the extent of the fire perimeter. It was impossible to tell if our home was in or out of the burn zone. The perimeter ran right through our road. This wasn't the kind of fire that sweeps through and is over. It kept popping back up and was spread by embers. Our neighborhood on fire. This photo taken by John Mazza shows a house on the neighboring street completely engulfed in flame. This is the ravine, or gully, behind all of our houses. John Mazza and his neighbor Mace Stanley took a stand against the leading edge of the fire as is advanced on our houses from behind. "The hoses kept melting," John told me. "We had to keep finding new ones." In the end, they stopped the fire through a combination of determination and luck. "The wind died," John told me. "If it hadn't, we wouldn't have been able to stop it." John Mazza took this photo of Mace Stanley fighting the fire with a garden hose. The two men working together managed to knock down the flames just feet from the nearest house. They saved two streets of houses, and all of the habitat in the ravine by their actions. For three days they, and the other volunteers, including John's wife Robby, and a core group of neighbors, worked to stamp down the fire when it sprang up again, putting out embers, smoldering railroad ties, and palm trees that burned like fireworks. They did all of that without fire department support, or electricity, or reliable cell service. I don't know the names of all of the people who worked to save as many houses as they could in this neighborhood, and I probably never will, but their courage and determination made a difference, and this story is just one of many last stands made by residents all over the burn area. Not every house could be saved, but many people had a home to return to because of the people who stayed and fought. 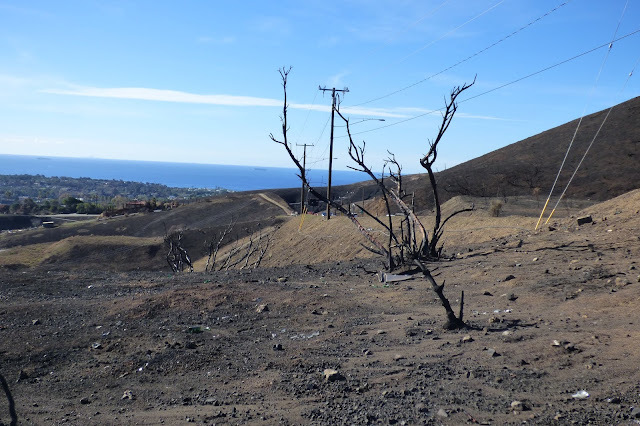 The last time Point Dume burned extensively was in 1935, before there were houses here. 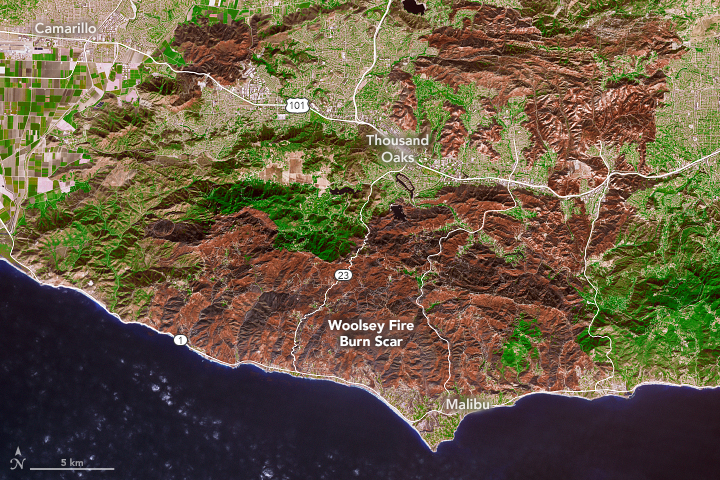 The Woolsey fire followed a similar course through the mountains to the sea, but was many times bigger, hotter, faster, and more destructive. 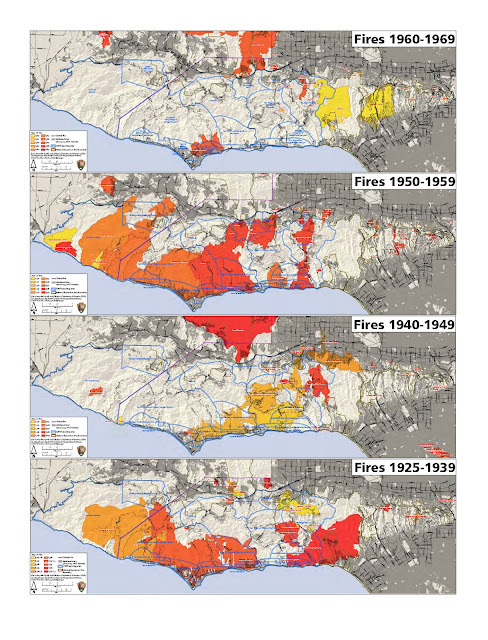 These National Park Service maps show the burn areas of the fires in the first half of the 20th century. The 1935 fire, in dark orange on the bottom map, burned through Point Dume and Malibu Park, on a similar path as the much large Woolsey Fire. The view from our garden after the fire and the first rains. Winter grass is already covering the fire scars, and you have to look carefully to spot the row of burned out houses on the ridgde, a brutal reminder of all that was lost. From my studio window I can see the burnt eucalyptus trees that are all that is left of an original 1950s Point Dume ranch-style house just a few hundred yards away across the gully—the one that was photographed burning, above) and beyond that, the chimneys of five burned out houses in a row on the ridge at Latigo Canyon. 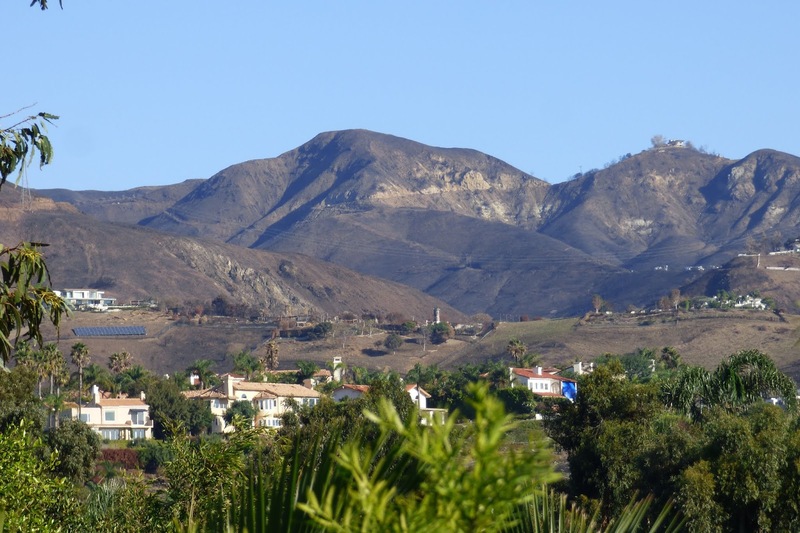 Recovery seems insurmountable, but Malibu and its neighboring communities will rebound. Spring will bring fire-following wildflowers to the bleak hills, the wildlife, adapted to a fire ecology in ways humans are not, will return. I saw our great-horned owl last night, and our garden in full of winter songbirds, singing despite the disaster all around them. This is the only major island of unburned vegetation in a swath of destruction that covers the entire Malibu portion of the Santa Monica Mountains, from Point Mugu State Park in the west, to Malibu Canyon in the east. I kept writing throughout the disaster. I had to. Not only is writing my livelihood, it was a compulsion. I wrote multiple articles during the 10 days we stayed with my brother's family in Seal Beach, not knowing what was happening at home except for what we could glean from friends and neighbors "inside." I pulled apart the book that was due at the printers the week of the fire, and rewrote the chapter on natural disaster. I knew I couldn't go to press without including at least something on the worst wildfire in Malibu's history, not with so much loss, and so much devastation. I wrote articles in the dark, relying on batteries, when we were finally allowed to return home, because we didn't have power, and for days and I haunted the Messenger Mountain News' office in Topanga and the Malibu Library, while we waited for power, and finally internet service, to be restored. You can read an account of the challenges of putting together a newspaper while under evacuation here. 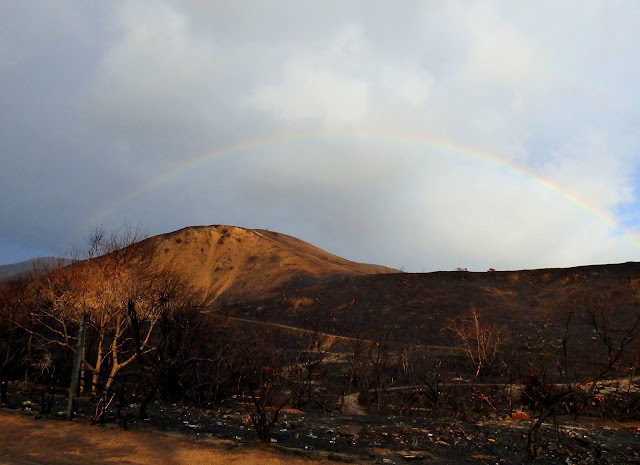 A rainbow, age-old symbol of hope and renewal, arches over scorched and blacked Corral Canyon. We still don't have landlines. You will find me standing in a tiny square of of cell reception in the garden in all weathers, shouting into the phone. I just finished an interview that way, in the rain. I've learned to take my notes in pencil so it doesn't run. It works, at least sometimes, and I have a house to go back into when the latest round of phone frustration is at an end. Many families do not, and some who do still cannot go home because their areas are unsafe. Others have to wait for smoke damage mitigation and other fire related repairs. There are still neighborhoods without power, and areas where going home again is painful because only a few houses survived in a field of absolute destruction. The path the fire took down Kanan Dume Road into Malibu. 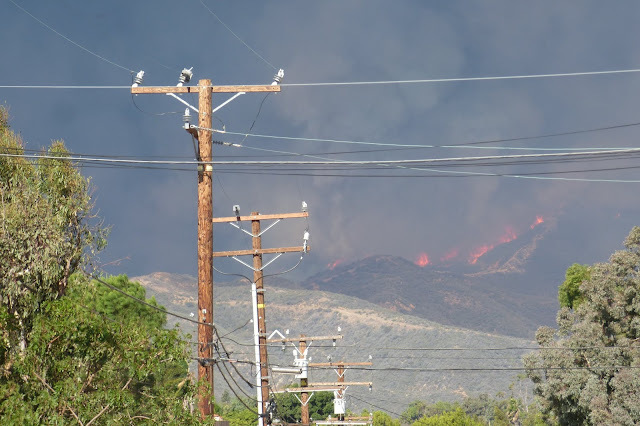 The entire corridor has burned, from the top of Ladyface Mountain in Agoura Hills, to the sea at Westward Beach. It will be up to the local media to continue to cover the aftermath of the disaster now that it has dropped out of the main news cycle. It's the thing we can do to help, at a time when it seems there isn't enough help in the world to heal the hurt and aid all of the friends and neighbors who lost their homes, not just in Malibu but throughout the Santa Monica Mountains. Recovery has begun, but it will be a slow and long process. Too many people lost everything but their lives, and everyone who has experienced the trauma of the disaster, regardless of whether they had a home still standing at the end of it, needs time to grieve and heal, to transform fear and anxiety back into the patterns of ordinary, everyday life. Little by little we move forward, one foot in front of the other, until the worst disaster in Malibu's history is history, and not live pain. I had an opportunity to write an op ed on the Woolsey Fire and the history of the Santa Monica Mountains National Recreation Area for the Los Angeles Times immediately after the fire. It was a chance for me to share some of the challenges this remarkable national park that surrounds Malibu has faced in its 40-year history, and to put the wildfire in perspective as another challenge that the park and all of the people who live in and around it and who care about it will recover from in time. You can read it here. And somehow, through all of the chaos, anxiety, and heartbreak of the fire and its aftermath, my book made it to the printers. Drawn in part from my writings on the Malibu Post, it is a collection of history and nature features illustrated throughout with archival images and my own photographs. The publication is bittersweet. I didn't know when I was writing it and choosing the photos that I would be chronicling life in a Malibu that no longer exists the way it did before November 9, 2018. 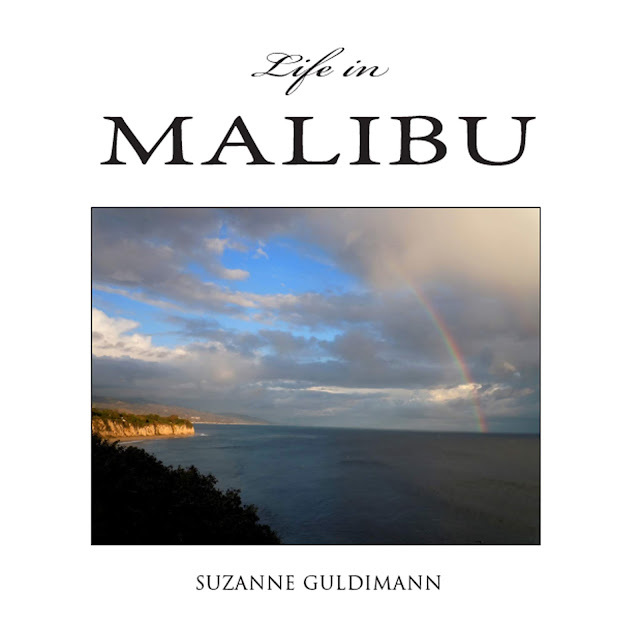 "Life in Malibu" is available on Amazon. This "Woolsey Chronicle" of yours is riveting Suzanne and an important documentation for those who tend to forget once the danger and excitement have passed.